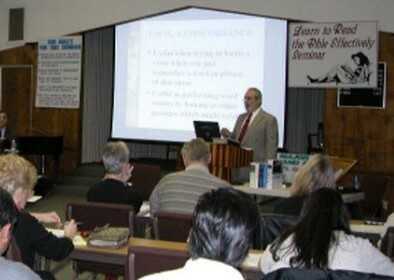 The Learn to Read the Bible Effectively Seminar is comprised of 6 concise and informative sessions that are delivered in a friendly and relaxed environment. So, whether you’re familiar with the Bible or new to reading it, we give you the information, tools and confidence to read it more effectively for yourself and to unlock the pages of the Bible for yourself. Effective. You will get more from your study with the tips, tools and techniques we share with you. Relaxed. Learn in a relaxed and informal environment. Enjoyable. Our sessions will give you the knowledge and confidence to keep reading at an enjoyable pace. Free Bible. You’ll receive comprehensive hand-outs and a free Bible. Feel free to bring your own Bible if you have one. No Charge! You will never be asked for money to run the sessions or for materials or anything else! Never Embarrassed. Don’t be worried about finding passages or asking questions. We are interested in helping you learn. No Obligation. You can leave at anytime. The Bible and notes are yours to take and use as you wish. Q. What if everyone knows more than I do? A. Lucky you, a room full of people to learn from! But seriously, everyone is there to learn and we assume no knowledge of the Bible. Q. Who is paying for the seminars and why? A. The Seminars are funded by the Christadelphians who think it is important that everyone has the opportunity to learn about the Bible for themselves. Q. Will I be put under pressure to become a Christian? A. No. We help you read and understand the Bible and then you decide what to do with that knowledge.